A rather graceful round-headed tree often with pendulous branchlets. Some forms are upright, spreading and considerably taller than broad. Foliage is a lustrous dark green changing to yellowish and reddish purple in autumn. Leaves are alternate, simple, elliptic to ovate or obovate, 3/4" to 2 1/2" long, 1/3" to 1 1/3" wide. The showy, exfoliating bark revels random patterns of gray, green, orange, and brown, appearing lace-like. Adaptable to extremes in weather, pH and soil. 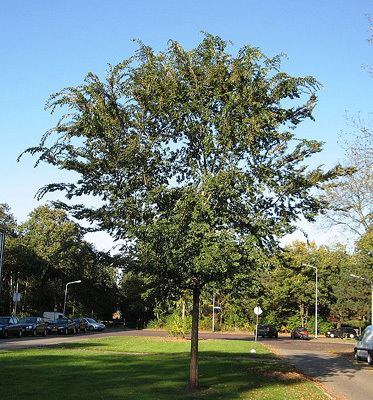 A very suitable tree for parkways, parking lot islands, and other confined soil spaces.